I write about Russia and 'postsocialism' more generally. Cheesed off, but not because of sanctions. Immiseration, elite disconnect and neoliberal convergence. That Russia has been a pariah state for a while (connected to sanctions after the occupation of Crimea and intervention in East Ukraine). That Russia is on a kind of lock-down with no outlet for protests and careful management of dissent by the state, or that Putin is so popular that protests are pointless or restricted to a small educated minority. Lastly, you might get the impression that oil money continues to keep the Russians reasonably quiescent – after all, the government spent heavily on social programmes before and after the initial shocks associated with the global financial crisis. The aim of this piece is not to go into the all too frequent errors, overestimations of Russian efforts ‘against’ the West, the misunderstandings that conflate domestic-orientated actions with those directed outward. Overall, the obsession with a kind of ‘Cold War 2.0’ makes debate all about ‘us’ in the West and obscures or impedes analysis of the increasing similarity of social, economic and political crises in states like Russia and the ‘West’. In this blog post I will present a kind of thought experiment about what could be called provocatively ‘neoliberal globalizing convergence’ by focussing on the forms of elite enrichment and detachment from ordinary people; the impoverishment and precarisation of the majority of citizens; and thirdly, ‘cheese’ (specifically the lack of access to affordable cheese). This is one anthropologically meaningful symbol of the failure of governance for ‘the people’ – the latter a category important in Russians’ understanding of the social state (“why doesn’t the state do more to look after ‘the people’?”). Elite enrichment is perhaps the one area where the Trump-Russia scandals may actually help us shed light rather than generate heat. As I write, it is emerging that Paul Manafort – who worked as Trump’s campaign advisor and who previously served Ukraine’s deposed president Yanukovych, is alleged to have laundered $75m dollars to avoid US taxes through a Cyprus bank tied to Russia. The opposition blogger Alexei Navalnyi has long made Russian corruption through offshoring and laundering a mainstay of his political campaigns against the Russian elite. Now today in the US we have a kind of mirror image – albeit in miniscule form – tens of millions is chicken feed compared to the billions alleged to have been offshored by the Russian elite. What’s more, these are the proceeds of crooked state-budget tenders, and the ill-gotten proceeds of privatised, and then asset-stripped, Russian companies – a process stretching back to the 1990s, not the ‘legitimate’ earnings of a ‘tyrant-fellating’ lobbyist like Manafort. The point is, the Manafort revelations are just the latest, and most direct, US-Russia linked examples of elites operating to extract and then protect (otherwise taxable, or ill-gotten) wealth beyond nation-state jurisdictions. More importantly, inter-elite relations between the US and Russia aside, we should be more concerned with the plain fact that despite all the individually targeted sanctions by the US and EU against Russia, the ‘West’ is still the banker for the Russian elite. It is alleged that even the top level Russian political figures supposedly banned from the EU frequently travel to holiday residences incognito, perhaps even via those ‘non-governing nations’ – i.e. British and US sponsored tax havens, such as Gibraltar, or Russian favourites like Cyprus, where their wealth is stored alongside that of the West’s elite. If the global financialization-capitalist moment means anything, it is that public political punishment (sanctions), or national, or even international legal jurisprudence shouldn’t really affect the private flows of expropriated wealth from poorer countries to richer ones. As a formerly highly industrialised country that had the neutron-bomb treatment of ‘economic shock therapy’ as Russia did in the 1990s, the re-current ‘capital flight’ which supports liquidity and financial speculation elsewhere especially after the financial crisis 2008-, has uncanny echoes of that earlier transition period from Communism. As the global capital accumulation cycle entered a slowing phase, the opening up of the vast resource extraction economy that was the USSR acted as a kind of stimulus to Western economies, flooding the market with cheap industrial commodities while enriching a small group of Communist-party-connected elites. Analyses such as these serve as grist to the conspiracy theory mill within Russia, by presenting these processes as planned by the West, rather than the result of capital in search of assets suddenly arriving in a new market. Opportunism is domestically presented as a foreign directed criminal conspiracy to pauperise Russia. Certainly, the wholesale asset stripping and under-the-radar export of resources formed the basis of economic and political power for the Russian elite and shifted abruptly a low inequality society to one of the most unequal in the world. It’s easy to understand the attraction of conspiracies when proponent cite the well-researched work recently done by Thomas Piketty’s team. In reviewing the present position, they baldly state: “there is as much financial wealth held by rich Russians abroad—in the United Kingdom, Switzerland, Cyprus, and similar offshore centers—than held by the entire Russian population in Russia itself.” (Novokmet, Piketty, Zucman 2017: 5). In this latest stage of offshoring, the main motor is not privatisation (now around 70% of GDP is produced by state-owned enterprises) or resource sale, but siphoning off state tenders and procurement ‘padding’ to the value of $17bn a year – or twice the state education budget for a country of 144 million people. I just love the irony of this British tax-authorities’ poster. The important thing is that despite lip service paid to the effect of sanctions on Russia and the punishment of reducing Russian access to international money markets, so-called ‘round tripping of capital’ from emerging economies to offshore financial centres (OFCs) and back as foreign direct investment (FDI) remains par for the course in Russia. A parallel process, described by the Guardian’s Luke Harding, protects the incomes and lifestyles of elite individuals named in sanctions. Any celebration of news of the delayed extension of US sanctions applied to military exporters in Russia misses the point. Weapons exporters can get Russian state loans and don’t export rifles or planes to the US. We must leave ‘sanctions busting’ aside as a minor issue, however interesting we find the relabelling of EU and Norway-caught fish to come from Belarus, or the diverting of Scandinavian produce via the Faroe Islands. The well-known salmon fisheries located offshore from the Belarus fjords. While ‘round-tripping’ FDI is not the same thing as ‘real’ FDI (Ledyaeva et al. 2015) which comes from transnational companies continuing investments in plant, production and personnel in the Russian Federation – Volkswagen cars being the example that features in my own research, in reality that ‘real’ FDI is also little effected by sanctions, except for an initial wobble in 2014-15. The ‘sanctions’ regime distracts from the ongoing and more fundamental incorporation of Russian economy and employment into the global capital systems – albeit with Russia forced into adopting a model of the low-cost manufacturing and relatively low-added value production activities – ice cream from Unilever, consumer automobiles from Hyundai, building insulation from Danish Rockwool. Gurkov and Saidov (2017) note two other more important points here – the MNCs produce in Russia for the domestic market, but now also for export, and increasingly move towards localisation of production – meaning that various parts of the supply chain – milk for ice cream, for example – are sourced from Russian suppliers. ‘Gold Standard’ ice-creams. A Russian brand belonging to Unilever. Advertised as the ‘tasty pride of Russia’. The point is not that sanctions should be targeting the jobs and livelihoods of ordinary Russians. That would be even worse than the status quo, which gives a veneer of political punishment, but leaves the game the same. The point is that the incorporation of Russia into the global economy has actually intensified under sanctions – not to the benefit of ordinary people, who increasingly face the same progressive deterioration in their living standards as elsewhere. If anything it is the ‘sameness’ of social suffering in comparison to other states that we should be more attentive to when studying Russia – rather than the obvious differences (such as political regime and ‘human rights’). 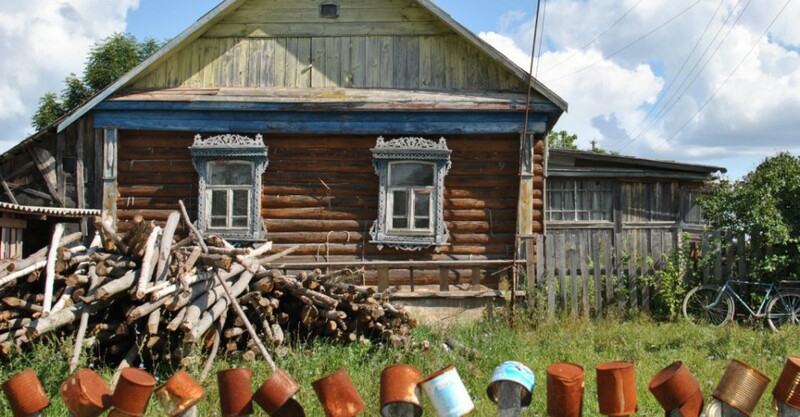 So it is here I want to move on to the second and more ethnographically informed part of this post: A parallel process to the preservation of capital for the elite in Russia is the progressive immiseration of ordinary Russians. Initially the general disruption in Russian-West trade due to the Russian embargo on EU produce led to many food staples becoming much more expensive and of dubious providence (including cheese). In addition, the difficulty in planning any investment in such a political environment led to increases in unemployment, indebtedness, wage arrears and underemployment among Russians. Finally, the continuing economic crisis was an easy excuse for the Russian government to further restrict welfare provision and other social budget items while ratcheting up the xenophobic rhetoric – ‘your pension isn’t inflation indexed, the rouble has crashed, but Crimea is ours, and look at Gayropa!’. The realities of everyday insecurity, impoverishment and long-term woe for many Russians pre- and post-date the sanctions regime, as Novokmet’s and Piketty’s research neatly summarises. In this section I to focus on the 2009-present moment. Why 2009? Because it was that year that marked the end of a decade of real improvements in all Russians’ living standards. It was also the year I started doing my research on the Russian working poor in small industrial communities. There was one consumer staple that for me came to symbolise ongoing ‘everyday precarity’ of Russians’ lives: dairy products – or rather their recategorisation from affordable staple to out-of-reach luxury. Why focus on dairy? Elsewhere I’ve written about the symbolic significance of meat, beer, and other foods for Russians (Morris 2014). But milk and in particular, cheese, cuts to the core of Russians sense of the present as ‘not normal’, and in turn to unwelcome realisations about elite cynicism and disdain for ordinary people, or ‘cattle’ as some Moscow intellectuals like to call them. Cheese for me, but not for thee. My experience is borne out by fine-grained survey research in Russia. Combining numerous data sources and taking a national overview, Strzelecki (2017, 10) notes that ‘the number of individuals who declare that they have too little money to buy enough food and those who cannot afford to buy clothes […] amounted to around 40% of the population. The low paid workers in some regions are now spending up to 80% of their pay on basic food staples [pdf link! ](TsEPR: 2016, 5). If poor Russian had long given up on being able to live a ‘normal’ consumer existence, with cheese and salami excluded from their diet, the sanctions regime suddenly gave the ‘middle class’ a taste of this experience. Because so many products, from dairy to fruit and vegetables, were imported, even the better off urban Russians in office jobs were suddenly faced with much higher prices as the Russian economy shrank by 5% percent in just half a year in 2015 and the rouble crashed. At the same time the state set about publicly destroying (bulldozing and then burning) tonnes of confiscated cheese and apple imports, refusing even to redistribute them to the needy. The shortages in imported staples coincided with the shrinking of the economy which meant that many ’better off’ Russians’ incomes were affected for the first time since the late 1990s. Only a small fraction of the metropolitan (Moscow and St Petersburg) middle-class have incomes ’indexed’ to Euros. Four years after the beginning of the sanctions, cheeses are back on the shelves, but the market now even more clearly reflects the gulf between the haves and the have-nots, with many more now in the ‘have-nots’ pile. In supermarkets forlorn packets of unbranded ‘Russian cheese’ sweat in cling-film alongside neatly packaged ‘President’ Brie (domestically produced by French subsidiaries – to avoid counter-sanctions). A relatively protected group like Moscow pensioners (with numerous social benefits and a higher, inflation-indexed pension) would struggle to buy either product. Even a ‘lucky’ pensioner might live on only 250 Euros a month – from which they will have to pay for utilities, as well as food. The suspicious-looking and almost tasteless ‘Russian cheese’ now costs six Euros a kilo, the ‘branded’ President, over 12 Euros. Why ‘suspicious’? Because stories real and imagined abound of how cheese has becomes a ‘dark story’ of Russian autarky after sanctions, with all kinds of fly-by-night producers rushing to fill the gap with ‘surrogate’ products containing palm oil, or in some cases bulkers not fit for human consumption. By some measures up to 25% of cheese is not what it seems, by others, up to 80% of cheese is counterfeit. You might not have considered this before but cheese is a ‘secondary’ product of milk production, and requires over 15 litres of milk per kilo of cheese. Milk producers’ costs have doubled since 2012. It’s telling that milk production and consumption today in Russia is still 40% below the late Soviet-period figures; a lot of milk production is small-scale and doesn’t enter commercial distribution networks. Long distances preclude distribution, production is inefficient and imports play a significant role in the market. Of course there are other measures of the continuing downward spiral of Russians’ economic well-being – the 20-fold increase in consumer credit at punitive rates, the resultant delinquent loans and epidemic of aggressive debt collecting being one. But as an everyday ‘simple’ pleasure of the table, cheese can perhaps more starkly show how badly ordinary Russians live, how little an obscenely wealthy elite cares about them, and how large and increasing is the gap between them. More than that it shows how Russia is dominated by both very visible real disparities as well as the open secret of the counterfeit. Adulteration substitutes for the real; and the longed-for ‘normal’ remains out of reach (what could be more a sign of normality than a bland holed triangular chunk of cheese). There are many parallels in the counterfeit political sphere of course – not least its rubber consistency and lack of aroma. However, in a different sense, Russia is just a ‘normal’ country, just not in the mildly optimistic sense the political scientists Daniel Treisman and Andrei Shleifer (2005) predicted: a middle-income country facing typical developmental challenges. Instead, I would contend that Russia is ‘normal’ in a different way: the dominant politics of ‘austerity’ (I prefer the concept of a continuously residualizing social state); real income falls over protracted time periods; the end of upwards social mobility and the privatising of educational opportunity; the expansion of indebtedness and precarity ever more widely in the population; the strengthening of multinational corporations’ clout and the intensification of their role in the economy (a process actually accelerated by sanctions – see Gurkov et al. 2017). All these represent Russia as converging with the ‘West’, regardless of the media focus on authoritarianism and the ‘new cold war’. Igor Gurkov & Zokirzhon Saidov (2017) Current Strategic Actions of Russian Manufacturing Subsidiaries of Western Multinational Corporations, Journal of East-West Business, 23:2, 171-193. Igor Gurkov, Alexandra Kokorina, Zokirzhon Saidov. (2017) The cul-de-sac of foreign industrial investments to Russia. Post-Communist Economies 29:4, pages 538-548. Morris, J. 2014. ‘The Warm Home of Cacti and other Soviet Memories: Russian Workers on the Socialist Period.’ Central Europe 12(1): 16-31. Strzelecki, J. 2017, ‘Painful adaptation The social consequences of the crisis in Russia’, Ośrodek Studiów Wschodnich im. Marka Karpia, Centre for Eastern Studies, no. 60, Warsaw, Poland. Treisman, Daniel, and Andrei Shleifer. 2005. “A Normal Country: Russia after Communism.” Journal of Economic Perspectives 19 (1): 151-174. This entry was posted in foodways, precarity, Trump and tagged cheese, Don Kalb, FDI, financialization, inequality, living standards, Medvedev, offshoring, pensioners, Piketty, Russia, sanctions, transnational companies on 16/11/2017 by Jeremy Morris.